Over the years, Cake Pan Cake has been one of King Arthur Flour's most requested recipes. And now we're proud to name this our King Arthur Flour 225th Anniversary Recipe of the Centuries. Dark, moist, delicious, and CHOCOLATE, this is truly a cake for all reasons, all seasons — and for bakers (and their family and friends) everywhere. Preheat your oven to 350°F. Lightly grease an 8" square or 9" round pan that's at least 2" deep. Whisk the dry ingredients together in a medium-sized bowl. Whisk the vanilla, vinegar, vegetable oil, and water in a separate bowl. Pour the wet ingredients into the bowl of dry ingredients, stirring until thoroughly combined. Pour the batter into the prepared pan. Bake the cake for 30 to 35 minutes, until a toothpick inserted into the center comes out clean, or with a few moist crumbs clinging to it. Serve the cake right from the pan; warm from the oven, it's wonderful with a big glass of milk. Or, once cool, frost the cake with this simple chocolate frosting: Heat the chocolate chips with the half & half until the chips melt. Stir until smooth, and pour/spread over the cake. For a non-dairy icing, substitute 1/3 cup cold brewed coffee (or water) for the half & half. 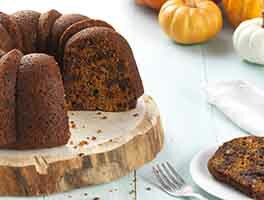 Store cake, well covered, at room temperature for several days; freeze for longer storage. Want to try the traditional method for mixing up this cake? Measure all the dry ingredients into the prepared pan. Blend the ingredients together thoroughly with a fork or whisk and scoop out three holes, or indentations. Pour the vanilla into the first hole, the vinegar into the second, and the vegetable oil into the third. Take the cup of water and pour it directly over everything in the pan. Stir all the ingredients together with your fork until well blended. Finish and bake as directed. 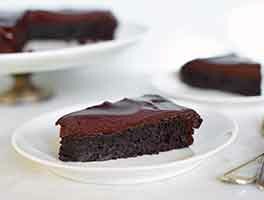 This cake is traditionally made with natural (not Dutch-process) cocoa. Natural cocoa will yield a cake with great chocolate-y flavor and a slightly reddish hue (think devil's food) compared to cake made with Dutch-process cocoa. While the original, non-dairy version of this recipe calls for water as the liquid, feel free to substitute milk, for a slightly richer cake. 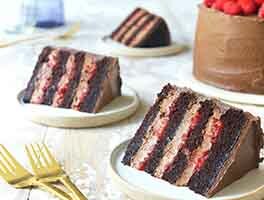 Or try cold coffee, for a mocha version; or even 3/4 cup water mixed with 1/4 cup rum, for an "adults only" cake! Want to make this cake into cupcakes? Portion the batter into a standard (12-cup) muffin pan lined with lightly greased papers; you'll use a scant 1/4 cup batter (about 58g) in each. Bake for 18 to 20 minutes (22 minutes if you're baking with Gluten-Free Measure for Measure Flour) in a preheated 375°F oven, until a toothpick inserted into one of the center cupcakes comes out clean. Remove from the oven and cool on a rack. Frost with the frosting in step #5 above, if desired. This cake is the real deal! I started off just making it for a friend who has a severe dairy allergy (obviously I did not make the glaze included in the recipe), but it was so good that I'm now making it any time a chocolate cake is called for (which is... a lot of times). I do add a tablespoon or two of cake enhancer, which I think helps with keeping it from drying out. I use the bensdorp dutch-process cocoa and it works perfectly. Easy, delicious, I will make this again and again and again. 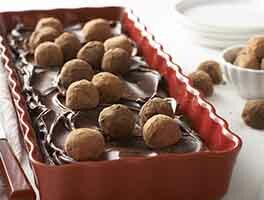 Made this recipe with Ghirardelli dutch process cocoa, and milk for extra richness. It wasn't as moist as I was hoping for, nor as chocolate-ey (I'm definitely a dark chocolate gal). 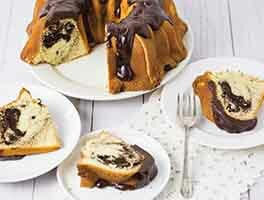 I am eyeing KAF's Chocolate Fudge Bundt Cake to try next. It has a higher proportion of chocolate to flour, and I think the eggs and yogurt will make it richer and moister. Has anyone tried both recipes and can offer a comparison? Dark and rich chocolate flavor. Easy to make and never sticks around for long. 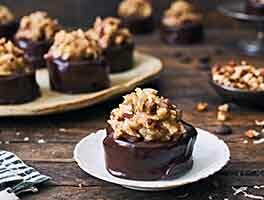 Has an "old-timey" taste that reminds me of my grandmother and the chocolate cakes she would make. One of my favorites. Easy and nice chocolate flavor. I thought the cake was a bit too spongey. Would definitely make again because it is a nice easy weeknight dessert. The four stars is for the cake not the frosting. LOVE the CAKE- the frosting not so much! I used fresh coffee in place of the powder - just substituted it in for some of the water. I will make this again! I needed something for desert but I didn't feel like spending hours making one. I saw this one advertised on facebook so I thought to give it a try. It took like 45 minutes from start to finish. I added a little raspberry jam under the frosting to give it a little something extra. It is one of the best chocolate cakes - very moist and delicious. I've made a lot of cakes but this one is going to be a go-to for me. I thought as an experienced baker this cake was "below" me. No creaming of butter and sugar? No adding eggs one at a time? No mixing dry ingredients alternatively with milk or other liquid? No skill regarding how long to beat/fold/mix everything at the various stages? Boy--was I mistaken. This cake and frosting is not only simple and fun to make but is really, truly delicious. What a wonderful surprise. I'll be making this cake again and again! Thank you KAF! I was having a bad day and needed chocolate cake in my life. I whipped this up on a Tuesday night with ingredients from my pantry and it could not have been easier. It was fudgey, delicious, and totally hit the spot. This cake is utterly addictive and a must bake.